I've seen many 7 Layer Magic Bar recipes, but none that include the all dressed, fully loaded to the max goodies that mine do... that's what makes mine heavenly! - Combine graham crumbs and margarine together. Press into greased 9x13 baking pan. 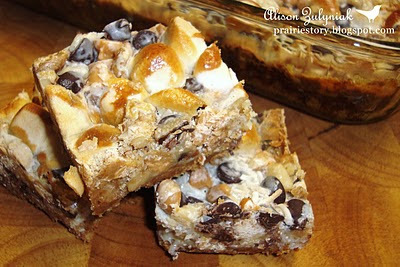 - Toss together chips, walnuts, coconut and marshmallows in bowl, then layer on top of the graham crust. - Evenly drizzle the sweetened condensed milk over it all. - Bake @ 350° for 30 minutes. - Completely cool to set, then cut. These look ooey gooey good. I think the magic about them would be how fast they disappear when you put them in front of people. I'm adding this to my baking repertoire this year! Looks delish!